We are yakkin’ with legendary Pittsburgh concert promoter, Rich Engler, AGAIN! He’s produced 5,000 concerts in the area. Aerosmith went nuts ripping up stuff at 3 Rivers Stadium. What did Axl Rose want for his birthday party? Go purchase Rich’s Book by clicking on the cover below. 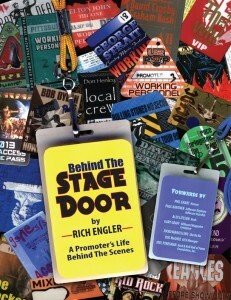 Behind The Stage Door is a ride through the years and a compilation of 80 tracks (chapters) and over 300 photos, posters, and admats from Rich Engler’s personal collection.